Olympian Robby Andrews recently made his way up from Manalapan to join Jersey City officials and members of the New York Road Runners club to announce the expansion of running programs from New York to Jersey City. Andrews, who is also a 2017 U.S. Track and Field Outdoor National Champion and a NCAA All-American, said he also hopes to bring some people from the running programs he operates in Manalapan to take part in activities in Jersey City. “I grew up in Manalapan and the community played an important part in my life as a kid,” he said. 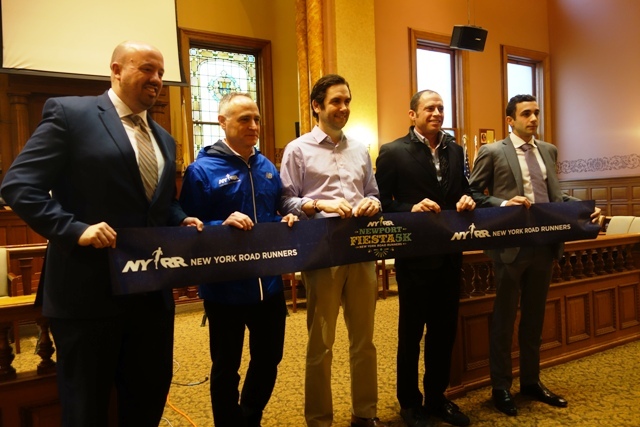 A coach at Princeton University, Andrews was part of a press conference announcing an ambitious new series of programs run by NYRR in Jersey City that includes a Newport Fiesta 5K slated for May 4. Surrounded by members of NYRR, Mayor Steven Fulop called it the next step in Jersey City’s public health programs. Michael Capiraso, president and CEO of NYRR as well as a Jersey City native, said the expansion of the runners’ club operations to Jersey City will provide new opportunities for local residents. In a joke that is extremely relevant to New Jersey, Capiraso said New Jersey is “Born to Run,” alluding to a song by New Jersey musical icon Bruce Springsteen. 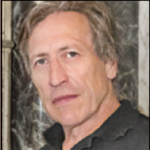 “Our growth into New Jersey provides the opportunity for New York Road Runners to reach thousands of dedicated runners who regularly participate in our premier races as well as reach new and diverse audiences,” he said. “In addition, NYRR is excited to bring youth and community programming to positively impact local runners of all ages and abilities. Jim Heim, senior vice president for NYRR event development said as part of the expansion, NYRR will host a number of events in Jersey city, including free youth programs throughout the year and at a number of races including one scheduled for April in Lincoln Park. The April event in Lincoln Park will be the first open run by NYRR outside of New York with the hope of expanding this to free weekly events in neighborhood parks throughout Jersey City. Since these will be run by volunteers, they will be free to participate in. NYRR puts on more than 50 races throughout the year. In 2018, nearly 30,000 finishers of NYRR events were residents of New Jersey. Among those, nearly 40 percent live within a 10-mile radius of Jersey City. In addition, NYRR intends to expand its flagship national youth program, Rising New York Road Runners, in New Jersey. Currently there are 20 New Jersey schools involved in the program. NYRR will also take over a 5K race that was started in 2004 by Newport, said Jamie LeFrak. He said he was pleased that an organization with the reputation of NYRR is taking over. Lefrak said the Newport race laid a great foundation for the running community in Jersey City. NYRR is partnering with the LeFrak organization, Newport Associates Development Company, and the city of Jersey City to organize the new race and to develop a strategic plan to engage the local community through health and fitness activities. This will include year-round programs to serve residents of the city. Heim said the May 4 event will start and finish at Newport Mall. He said the roads are wide and flat and there is access to the area by car and public transportation. The NYRR Newport Fiesta 5K will be a unique race with an expansive route through the downtown area, he said. The event will take place at 5 p.m. with the start and finish line at Washington Street, just south of the Newport Parkway. A series of free youth races will take place prior to the 5k. Festivities will be held throughout the day and will culminate with a post-race festival. Registration for the event can be done at mynyrr.nyrr.org.